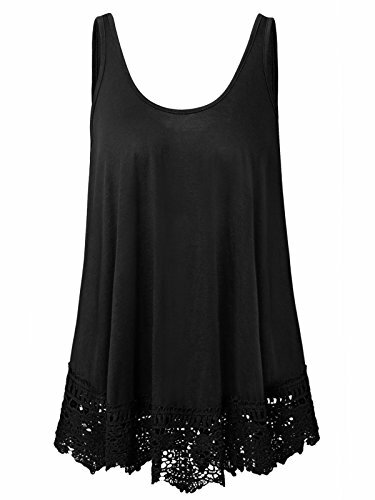 This is an elegant tank top with soft, smooth skin touch material, stretchy-soft knit gets extra flare with a tummy-concealing design that'll keep you comfy while you socialize. Delicate lace trimming the hem the romantic fabric is trimmed with ruffles for extra dress-up appeal. This premium tank features a scoop neck and burnout construction for an everyday wardrobe staple. 1X Bust 41" , Length 30"
2X Bust 43.3", Length 30.7"
3X Bust 45.7", Length 31.5"
4X Bust 48" , Length 32.3"
SOFT & FLOWY - This is an exceptionally soft top , it crafted from featured fabrics knit, Light weight and flowy creates the most flattering fit. Construction for an everyday wardrobe staple. ADORABLE LACE HEM - Timeless lace has a crisp and refreshing finish on a tank silhouette that's designed to be figure-flattering and easy to dress up or down. UPDATED BASICS - This premium tank has delicate lace trimming the hem for a dressy take on your everyday tank, update your basic tank for a fresh take on your everyday top. OCCASION - Perferct fit to wear over your favorite leggings or shorts,skinny jeans, easy to layering with cardigan, coat, jacket or wear it alone. This is a versatile Tank for daily,Beach,Sports,Work,Picnic,Park,Vacation Holiday ,Dating ect, that's will be your summer ready essential. If you have any questions about this product by XiaoMaAnJi, contact us by completing and submitting the form below. If you are looking for a specif part number, please include it with your message.